The owls are symbol of ancient Greek goddess of wisdom - Athena and this is why people think of owls as wise creatures but not only, are they also cute. It is making them very popular nursery décor component. The one that hard to resist with their large eyes detecting everything around and curious appealing personality. We have created our version of owls’ wall decals set, that turned into one of the most desirable, reasonably priced yet made of excellent removable vinyl material. The owls comes in a few colors and put together for you to simplify installation. 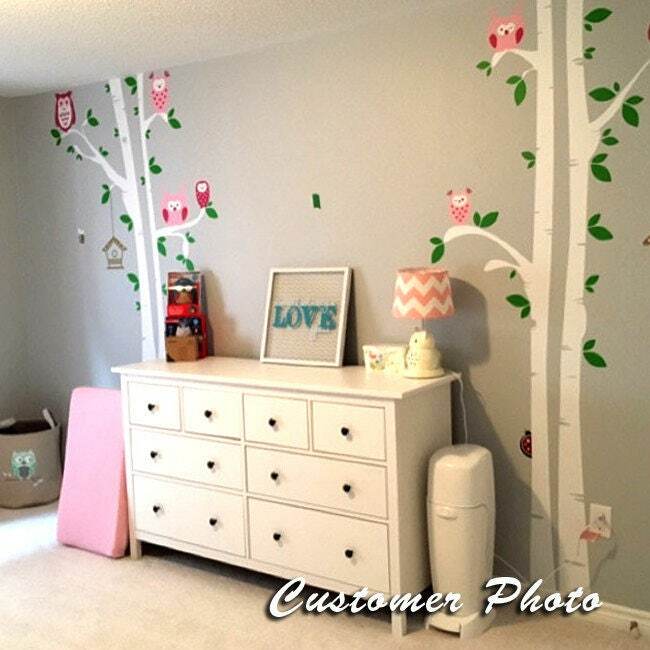 This theme includes Three Large Birch Trees and Seven Cute Owls, Leaves and Two Birdhouses. Go ahead and compliment your baby nursery with Owls Sitting on the Trees theme, it fits any bedding set with just a little space on the wall. Color changes are available at no additional charge and you can choose up to 4 colors from our color chart. Please remember to choose ONE single color FOR ONE another single color. For example, all elements in ORANGE to the same elements in TEAL.